Scientists have long sought evidence that Bs-mesons, particles that consist of a beauty quark and a strange quark, decay into a final state of two muons. In 2012, researchers from this programme found the first hint that this decay exists. This year they successfully demonstrated the decay's existence. They achieved this with the help of the LHCb experiment at the particle accelerator at CERN near Geneva. 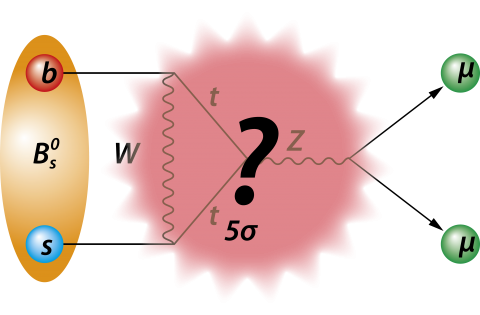 The process in which a B-meson decays into two muons involves a collision between a beauty quark and an anti-strange quark. During this collision the particles destroy each other. In the standard model of particle physics, this decay is very strongly suppressed and so it rarely occurs. That is because it can only occur with the help of quantum fluctuations, a process in which new particles are formed very briefly. By taking the effects of these quantum fluctuations into account, physicists can search for previously unknown particles or forces. The researchers managed to demonstrate the existence of the B-meson decay for the first time by combining measurement data from the LHCb and the CMS experiments. Their finding has so far proved to be consistent with the prediction of the standard model. Besides proving that a Bs-meson can decay into two muons, the researchers are also searching for even rarer events in which a Bd-particle (consisting of a beauty quark and an anti-down quark) decays into two muons. The ultimate aim of this research is to describe the relationship between these two decay processes. By measuring this relationship experimentally, the scientists can test the validity of the standard model. Schematic representation of the decay of a Bs-meson into two muons (μ+ en μ-). The lines indicate which known particles are created. The question mark represents new, unknown particles that can be temporarily formed.